Did you lost windows 7 administrator password? Are you worried about the next step to get the solution to reset it? Here it comes, yes you can reset Windows 7 password your own through various available methods to reset your lost password. Windows 7 creates a default build-in administrator at the time of windows 7 installation. This default administrator doesn't have any password. In the password loss situation, you can assign password to default administrator and access your computer. Follow the steps written below for complete procedure. Start computer press F8 key while it is booting. It will show you black screen with few options select "Safe Mode with Command Prompt" option with arrow keys and hit Enter. Now computer will start loading safe mode and at the end command prompt will visible. 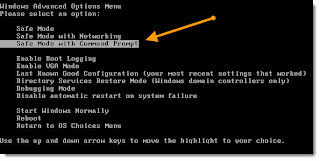 Now with the help of this command prompt you can reset administrator password. Type “net user” command and hit Enter it will show list of all users. Now type net user xyz 123456 to reset the password of the user xyz to 123456 (in place of XYZ you need write the name of user for which you want to change password and write your desire password in place of 123456) and press Enter. A message “the command completed successfully” will appear that means your password has been successfully reset. Now restart your computer and login with username: xyz and password: 123456. you can access your computer and reset other accounts password control panel. This is the easiest way to reset lost windows 7 password. But it will work when you are able to start computer in safe mode. If safe mode could not be loaded then you need to try some other method to reset windows 7 password.